Companies looking to build new facilities are searching for sites suitable for development and relatively risk free. Certified sites fill the demand for project-ready industrial sites - making the decision to locate in Iowa easy. 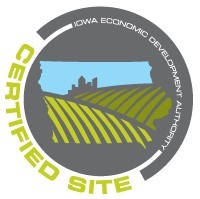 Iowa’s Certified Sites program parallels a typical site location process. A credentialed Iowa Certified Site has relevant site-related data and documentation accumulated and is designated as “development ready”.